In my eyes it is never good to be late, in New Balance's and Intel, it might have been the best thing. Seeing the mistakes and bad UX/UI from other companies, they seem to have made a pretty good watch at a GREAT price point $300 is amazing. JOIN STRAVA Track your workout and connect with a community of runners worldwide. BRING YOUR MUSIC Sync, store and listen to Google Play playlists via Bluetooth™ headphones. KEEP THE PACE Track your run time and intervals with one-click lap functionality. MAKE IT YOUR OWN Download apps and customize your dashboard. *RunIQ's activity tracking metrics (including location, distance, heart rate, pace and cadence) are estimates and may not be completely accurate. Accuracy is affected by factors including physiology, nature of movements and location of device. pretty good selection for right out of the gate. CES Is Here, Casio Show's New Watch! Casio's second watch doesn't look much different than the outdoor smartwatch it revealed at last year's CES. However, the software brains inside the ruggedized timepiece have been given a strong nudge forward. This is one of the first Android Wear 2.0 devices to surface, over half a year since we first got to play with Google's retooled wearable OS. The watch -- designed for outdoors types -- also comes equipped with low-power GPS and color maps that can be downloaded offline for true outdoorsmen and women. You will survive. Yep, as we said earlier, the design is very similar to the original. Casio has, however, added button guards and a new protective bezel -- important when your outdoors watch costs a few hundred dollars. For usability while wrestling bears or kayaking for your life, the buttons are now different sizes to help differentiate while using it. 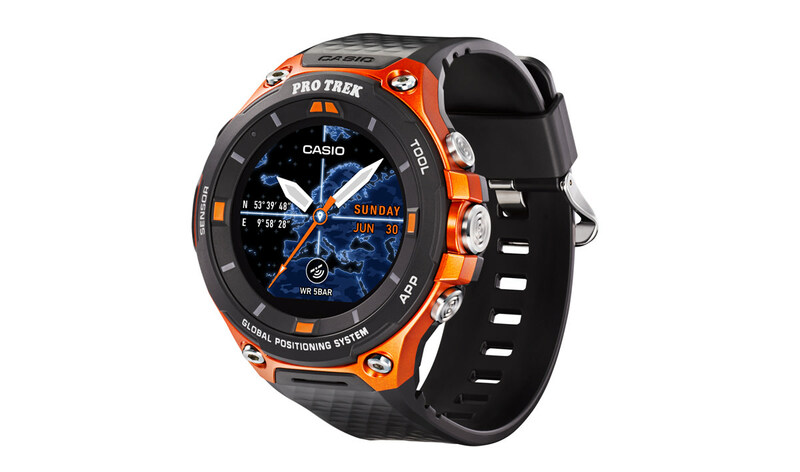 App-wise, Casio has further developed the things its Pro-Trek watch does best, with fishing, hiking and cycling features all well represented.